SOUTH Down Alliance Party Councillor Patrick Clarke has told delegates at the Party’s annual Conference that other parties should take lessons from Alliance and show true commitment to a shared society. Speaking after the 42nd annual Alliance Party Conference at the La Mon Hotel on Saturday 2 March, the South Down Alliance Party spokesperson, Newcastle area Councillor Patrick Clarke, said: “While other political parties are tired to the past and seek to entrench division in the interests of short-term political gain, Alliance has been forward thinking and committed to rebuilding Northern Ireland. 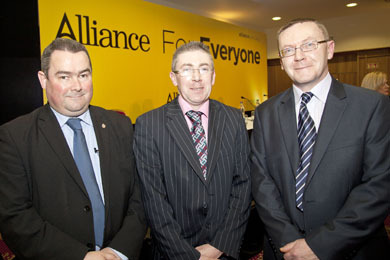 Alliance Councillor patrick Clarke, centre, invited his indepependent counclllor colleagues Terry Andrews and Mickey Coogan on Down District Council to the Alliance Party annual conference in the La Mon Hotel. “It is not about erosion of culture but rather mutual respect and dignity for all traditions. There is no room for triumphalism in a shared future and that is a lesson that a number of people in the Northern Ireland political spectrum have yet to learn. “Alliance has weathered the storm and the role we are playing is pivotal. It is as necessary now as it ever was. We will continue with that work, undeterred by the threats against us, as we have simply come too far to risk going backwards. A peaceful and democratic political process truly is the only way forward for Northern Ireland. “The politics of hope and aspiration are where the best future lies for everyone in our community. Alliance will continue to lead the way in articulating a clear vision of a shared and inclusive future for everyone, the opportunities that realising that potential will bring and in building the bridge to take us there. The Conference was opened by Alliance Party President, Councillor Billy Webb, who welcomed delegates and special guests. The conference continued with a panel discussion “For Everyone – Alliance Blueprint for a Shared Future” For Everyone overview, Housing, Integrated Education and Shared Space . The panel was chaired by Chris Lyttle, MLA & OFMdFM Vice Chair other speakers included Judith Cochrane, MLA, Trevor Lunn, MLA and Cllr Maire Hendron. A shared future and me discussion introduced by Stewart Dickson, MLA, Chief Whip the panel included Kathleen Ireton, Stephen Donnelly, Stephen Donnan (members), Cllr Laura McNamee. Dr Stephen Farry,MLA, Minister for Employment and Learning spoke of the challenges ahead in developing skills for the future employment. Mr Simon Hughes, MP, Deputy Leader Liberal Democrats was a fraternal speaker from Westminster. Naomi Long, MP, give her Deputy Leaders’ speech and introduced the party leader with great applause from delegates. David Ford, MLA, Minister for Justice & Party Leader acknowledged the applause from delegates before delivering his party leaders speech.